TripAdvisor makes this content, and all associated links, available to interested parties at no cost in exchange for the free traffic driven to TripAdvisor from each integration. All displays of TripAdvisor Content on your website and/or app must be approved by TripAdvisor prior to launch. You must supply links to the test site and/or app on which you plan to display TripAdvisor content and approval to display publicly is contingent upon meeting all of the requirements set forth below. If you do not submit a request to go-live within six (6) months of receiving your provisional key, your API access will be terminated. Note: If you wish to use the images below, they should be copied and hosted on your site. Do not reference the images on this page directly via code. The full TripAdvisor logo must be shown on every page that displays TripAdvisor Content. The logo must be positioned above, and as close as possible to the TripAdvisor Content. Logo can be found below and must be used without modification. 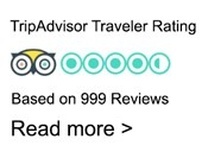 2) Be accompanied by the text "TripAdvisor Traveler Rating"
3) Shown with the number of reviews on which the rating is based next to, and to the right of, the rating bubbles. This number is dynamic and must be kept updated via the API. A TripAdvisor logo must be placed on the homepage of your site indicating inclusion of TripAdvisor ratings. TripAdvisor suggests the wording "Ratings Powered by TripAdvisor" to be used in conjunction with the logo. The numerical display of the total reviews an aggregrate rating is based on must be linked to the business' detail page on TripAdvisor. A clear invitation to click must be visible. e.g. underline the number of reviews or add a 'Read more >' link. Note: If your website and/or app is available in a language other than English, all text strings noted above must be translated into the relevant language.